Many ways your donation can make a difference! Every year our Family Fun Days bring over 500 individuals for special days to see the Easter Bunny, Santa, crafts, snacks, face painting, bounce house, train and more. These special days provide children and their families with an opportunity to enjoy a special outing in an autism friendly environment that many of them can’t enjoy in typical community events. For most of these children, it is their first experience to enjoy these activities where their difficulty to relate to their environment, speak, handle their behaviors is more accepted. In addition, the families are better able to cope in a group setting among other parents who also feel the stigma from their child’s difficulty with public outings. Social times for individuals with an Autism Spectrum Disorder. A fun time to come together in a safe environment and fit in a group of peers without fear of being bullied or feeling like the odd one out. Social events will include games, activities, outings and dinner. Our four monthly support group meetings grow each month. FEAT-NT provides free childcare so that families can come and share and learn from one another ways to better help their children. Our parent and sibling support group meetings help families understand and feel that they are not alone. Not only do they share their feelings of isolation, but also what works for their family and resources. Our adult support group meeting started one year ago and has tripled in size. FEAT-NT provides 1 of only 2 or 3 support group meetings for adults with autism in all of Dallas, Tarrant and surrounding counties. We help adults with ASD by providing them with resources to find jobs, counseling, therapy, transportation and other services. Our group also provides them the opportunity to meet others like them helping them feel less isolated. For some of them, our monthly support group meeting is one of their only social opportunities. FEAT-NT is especially thankful for the companies that support our programs and help us make the lives of those with autism better. Each month FEAT-NT will recognize those that donate to our ongoing programs in many ways. 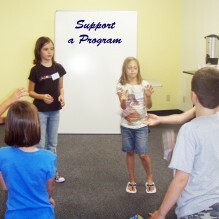 To donate towards a program please use our online donation form.